Syracuse has always been a popular place to live, with many opportunities linked to the land; it lies along the Arkansas River making it one of the most productive areas for wheat, hay, corn, and milo. Our agriculture based economy is also fortified with feedlots and dairies. The huge elevators and shiny railroad tracks reveal the major source of our prosperity. Syracuse is a town of values and friendliness, and is an excellent place to raise a family. This is the oldest settled town in Hamilton County and one of the oldest west of Newton. The business and agricultural opportunities of these western lands were so extensively advertised, mostly by the railroad, that it came to the attention of a group of people in Syracuse, New York. After studying the literature and discussing the pros and cons of such a bold venture they effected an organization and decided to send a committee to spy out the land and see if it would be a suitable place for a colony to establish homes. E.P. Barber, the leader, and organizer, with two companions, D.C. Ackland and S.R. Jones left the state of New York to investigate this virgin territory. When they reached Dodge City they found that passenger service had not yet been established on the new railway work train from Dodge City and arrived at what is now Syracuse on December 25, 1872. At that time Syracuse was only a whistlestop, with a side track and water tower named Hollidaysburg. 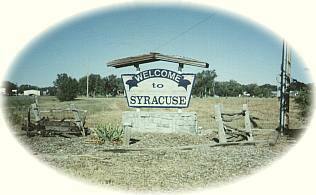 Later the name was changed to Syracuse in honor of their home town, Syracuse, New York. Hamilton County has 54,602 acres of walk-in hunting. The Tamarisk Golf Course is a 9-hole regulation length course, fully irrigated, situated along the beautiful Arkansas River. Two distinct architectural types are featured. Golf cars are available for rent. Walk-ons accepted at all times. Steel spikes are banned. Enjoy your stay at Syracuse with a visit to the Hamilton County Museum. There are many exhibits displayed in cases as well as period rooms set up to give you a glimpse of life at home for the early pioneers of the western plains. Shelter house, bathrooms, playground equipment, picnic tables, horseshoes, shade. The following are two accounts detailing the Leoti-Coronado county seat fight.